The Maricopa Police Department is investigating three burglaries that occurred New Year’s weekend. CNC Barber Shop and Spa, 19756 North John Wayne Parkway, was broken into Dec. 31, according to the store owner Carla Neal. Neal said someone smashed the front door and broke open the cash register. 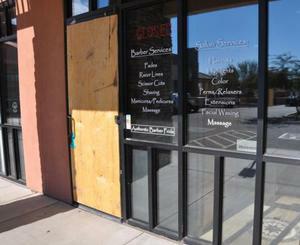 “It was basically a smash and grab, where someone threw a rock through the door and tried to grab whatever they could find, but apparently nothing was taken,” said Maricopa Police Department spokesman Sgt. Stephen Judd. The store had security cameras in place that caught an image of the suspect, but Neal said it is hard to make the person out. Maricopa high school was victimized by burglars twice over the weekend according to Judd. Though the school burglaries were reported on Monday morning, it is believed they may have been carried out earlier. The perpetrators vandalized both buildings and stole undetermined amounts of property. District officials would not comment as to what types of items were stolen. “The investigating officers are still looking into what may have been taken in the burglaries,” Judd said. The school and police are currently reviewing security camera footage to gather information on the suspects. If you have any information about these crimes please call the Maricopa Police Department at 520-316-6800.